Here’s our top picks for the best low light houseplants that are also easy to care for. When you walk through the houseplant section of your local hardware store, you may think that you don’t have enough natural light to support a living plant. Don’t despair, there are plenty of houseplants out there that thrive in low light conditions. Houseplants aren’t just a great way to freshen and clean air in your home, they also provide visual interest and texture. And houseplants are perfect for filling those pesky empty corners and funky spaces that you don’t quite know how to design. 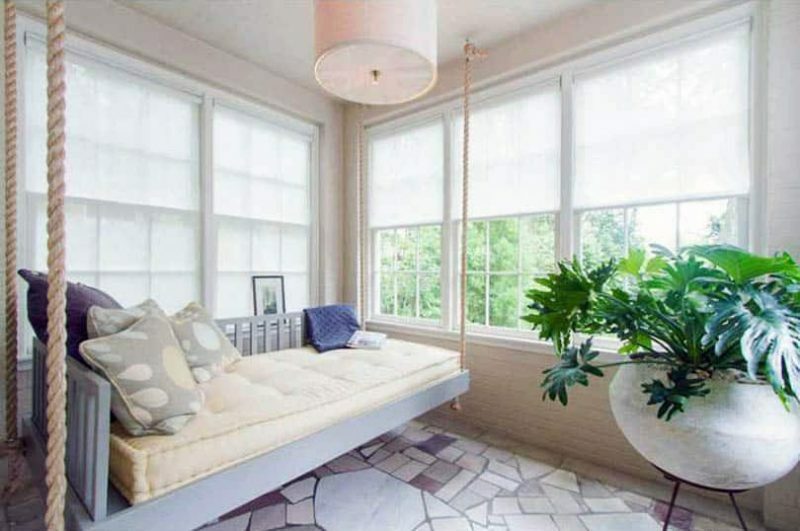 Add houseplants to your home, they will brighten your day and amp up your design. For more ideas visit our page about the best indoor trees here. Snake plants are one of the most popular choices for houseplants, and with good reason. 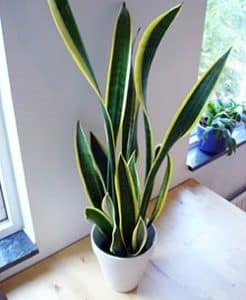 Snake plants are easy to care for, they don’t need much light, they don’t need much water, and they don’t have insect infestation problems. Pop them in an area that gets indirect sunlight and water them once in a while and you are good to go. Make sure to pot them with a free-draining soil so the roots don’t rot and don’t water them too often. Additionally, snake plants are awesome to look at. They have long, tall leaves in varying shades of green. Some varieties have leaves that are bordered in yellow or white, some are tinged red, and some even display beautiful twisted leaves. A perfect plant for the negligent indoor gardener, stunning looks and doesn’t mind getting a little dried out once in a while! Ferns are another good choice for indoor plants, especially in a bathroom where they can get the humidity they need. Although they are low-light, they do need afternoon or morning exposure to sunlight, so pop them in front of a window that will get a little exposure every day. Ferns don’t like strong, hot sunlight though, so don’t let them sit in front of a window that gets all day exposure, especially in the summer! Ferns give you lush, full greenery that lends a sense of woodland whimsy to your space. They are a cheerful, easy to care for plant that will add a lot of visual splendor wherever you chose to display them. 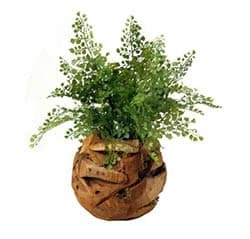 Some of the best ferns for indoors are the Maidenhair fern (Adiantum), Boston fern (Nephrolepis exaltata), Silver Brake (Pteris cretica), Bird’s nest (Asplenium nidus), Kangaroo paw (Microsorum diversifolium) and Button fern (Pellaea rotundifolia). Philodendrons are a classic indoor plant and have been a must have for indoor gardeners for decades, if not longer. Their beautiful heart, shaped leaves and leggy vines make for a green paradise wherever it is planted. When placed close to a window but safely away from direct sunlight, they thrive and grow without fail. They need regular watering, but let the top inch or so of soil dry out between watering days so that it doesn’t get waterlogged. You can take cuttings from Philodendrons and start new plants in budding vases or even just a glass of water. Philodendrons are often confused with Pothos, as they have similar looking leaves. 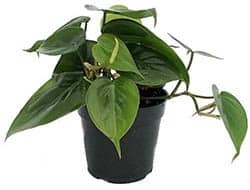 It is important to be sure that you have the right plant as Pothos are toxic and can harm pets and young children. 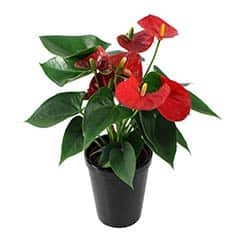 The Anthurium, with its broad, deep green leaves and red, pink, or white blooms only looks like a high-maintenance exotic luxury! In reality, this plant is an easy to care for must have in the well-designed home. In super low light situations, these plants will grow slower and flower less but they will not die off. I would be remiss if I were to neglect our old friend, the Lucky Bamboo. They like indirect light and are ridiculously easy to care for. As all bamboo, these are fast growers and you can prune them back if they are getting too tall for our space. 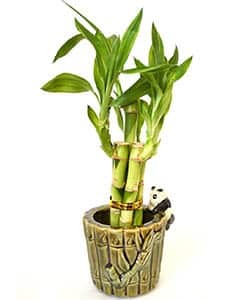 Lucky Bamboo can be purchased braised, in water or rocks, twisted, and even woven like a mini bamboo wall. They add texture and interest and are small enough to be used as a tabletop plant or even be placed on a shelf. 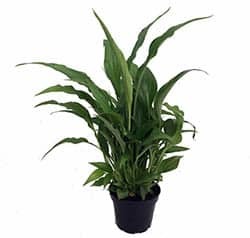 Peace Lilies, known in some circles as closet plants because of their tolerance for low light, are a beautiful choice for a houseplant. With wide, shiny, dark green foliage and beautiful white blooms, they are elegant and classy and really do bring a sense of peace to your space. Another fantastic low light plant is the Cast Iron Plant. It is easy to care for and really asserts itself visually, with thick, dark leaves. It is a great backdrop for creating a grounded, earthy feeling in a space. The Cast Iron Plant is a slow grower, not susceptible to disease or insects, and isn’t fussy about watering or light. 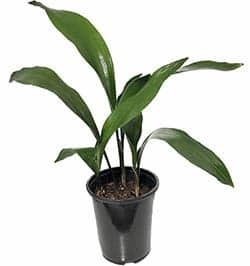 The full height is about two feet when fully grown and it looks great against the variegated greens of a snake plant when placed in a multi-plant arrangement. These are just a few of the most popular low light houseplants that are available. Each one lends something a little bit different, whether it is long, tall leaves, beautiful blooms, or delicately vining tendrils, houseplants are just good design. Even if you live in an apartment with just one lonely window, you can still enjoy the clean, fresh air and natural beauty that a houseplant provides.